How to read the newspaper for UPSC IAS is an important question in any aspirant mind. Because your dynamic part of IAS preparation mostly depends on the daily newspaper reading. A newspaper is an important thing in our daily life in today’s world which publishes news daily to let the people know what is happening around them. Reading of newspaper is a good habit for everyone which is almost the first thing that wishes you in the morning. It is a very important source for the people who are preparing for the government competitive exams and other private exams. But many of the people are often confused on how to read the newspaper to get successful in their upcoming exams. Along with the study books, it gives important details for current affairs which are the frequently asked question in the preparation of IAS exam. Candidates should know it is not necessary to learn all the information in the newspaper as part of your preparation. 1 How to read the newspaper for UPSC | IAS | Competitive Exams? 1.1 What to read in the newspaper for your IAS Preparation? 1.1.5 What news to avoid? 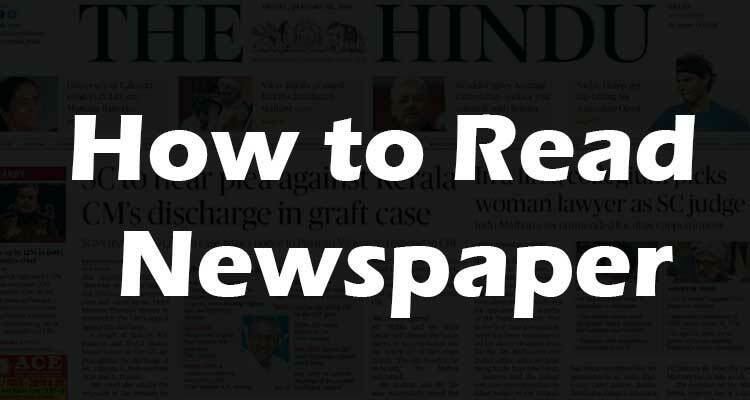 How to read the newspaper for UPSC | IAS | Competitive Exams? There are some useful tips which may be useful to get succeed in your upcoming exams when properly followed while reading the newspaper. First of all, get the most recommended newspaper for the IAS exam by discussing with people who have experienced in Civil Service Exam or other government exams. From our point of view, “The Hindu” newspaper is the most recommended one as the IAS exam Newspaper. Along with that newspaper also read other articles to get the complete picture of the news. Try to read the newspaper within one hour. Some people spend 3-4 hours of time on reading it; even if they do it for a longer period it won’t work so try to finish it soon. Keep the past year’s question papers with you to refer them and try to understand how questions are asked. Use the following websites, if you need more points for a particular topic. What to read in the newspaper for your IAS Preparation? Majority of the students, don’t know what to read in the newspaper. Freshers always use to tell, that he/she facing the issue on the news selection. That means they are unable to recognize which news is important for our syllabus and which is not important. So, We have stated some points to make your newspaper reading little easier. You can also see the advertisements by the ruling party where they list their achievements. This will give you a list of the developmental schemes and their provisions. You will know which ministry deals with what schemes. News related to the Constitution, amendments, etc. Who defeated whom in the by-elections? Etc. News of national importance – Always focus on the conclusion of an event. For example, if there is any massive attack done on any matter, focus on why it happened and how the country is lacking in a way to solve it. Instead, you don’t have to memorize the number of deaths and all. The same thing goes as well for a natural disaster but learns about the geography behind the disaster. Political news like an X-party member blames a person of another party for taking bribes, etc. Government press releases related to any government institute, Planning Commission, RBI, banking reforms, reforms in the economy, agriculture, industry, etc. NASSCOM, ASSOCHAM – related news that affects business. International organizations like the UN, ASEAN, WHO, IMF, etc. and their reports/publications. India’s role in them should also be read. Major political events in other countries that have possible international ramifications like a military coup, uprisings, etc. News about any endangered species, any species becoming extinct, etc. Regional news should be avoided unless you are preparing for the UPSC interview.